I remember the first time I made Chicken Cordon Bleu. It was an epic failure. Kale and I had only been married a few months. One night we planned to have some friends over for dinner, and I thought making Chicken Cordon Bleu would be a great dish to impress with! It involved pounding the chicken, which I had never done, and rolling the chicken and blah blah blah. Yeah, it didn’t turn out so well. At all. It was lacking in flavor and looked pretty silly. I was so embarrassed! I wish I would have had this recipe back then. It is so delicious, and could not have been any easier to prepare. 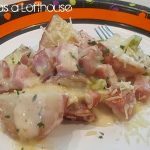 All you have to do is cut the chicken breasts lengthwise to form thinner cutlets and just layer the ham and swiss cheese on top. Sprinkle on some fresh bread crumbs and pop ’em in the oven. What made this chicken so outstanding was the Parmesan-Dijon Cream Sauce to spoon over the top! It is super duper delish! This chicken will be a permanent dish in our dinner rotation. A big thank you goes out to Mel from Mel’s Kitchen Cafe for such an awesome recipe! 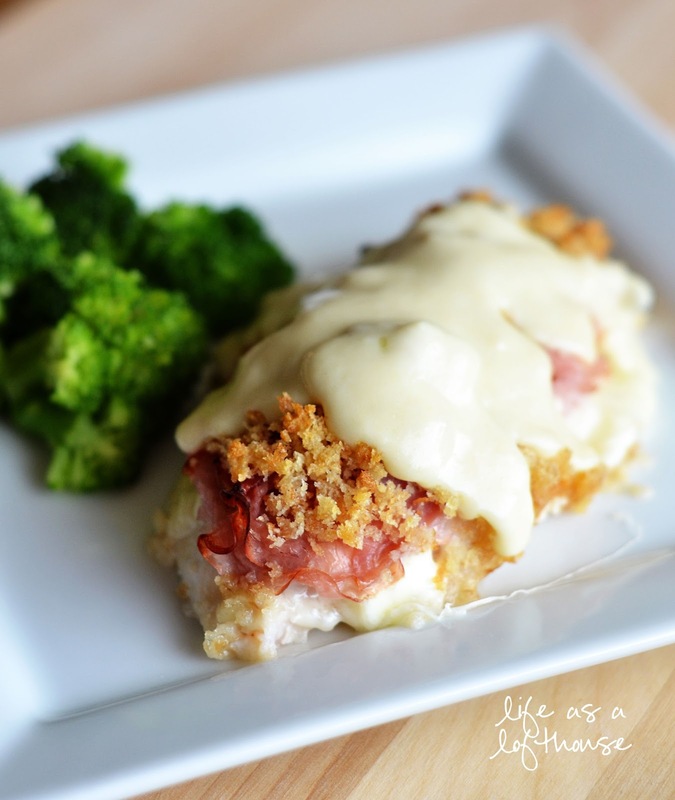 The best chicken cordon bleu ever and this recipe is a cinch to make! Serve each chicken cordon bleu with warm sauce. ENJOY! **Please use fresh bread crumbs. Not store-bought. It really helps this chicken taste so great! Is there any houses for sale on your street? I need to be your neighbor. this looks great!! I need an easy chicken cordon bleu recipe. Can’t wait to try it. I love chicken cordon bleu. Yours looks really mouthwatering! My favorite dish and you just made it weeknight accessible! Genius!! This is the same version of cordon bleu that I make and we love. I haven’t made it in ages though. Your photos looks delicious. I’m putting this on the meal plan for next month sometime. Thanks for the reminder! Mmmm… definitely going to have to try this! Wow Holly…this looks AMAZING! I am adding it on next weeks menu plan fo-sho! y-u-m. The chicken looks delish, and that sauce–yum! Holly I love chicken cordon on bleu. That looks really good and I have to agree fresh bread crumbs do make a difference. I giggles about your first attempt. I too had my share of disasters when I first got married. It is so funny to look back at them now. looks like you have mastered the cordon bleu! I’ve so been there with making recipes to impress that somehow do the opposite. 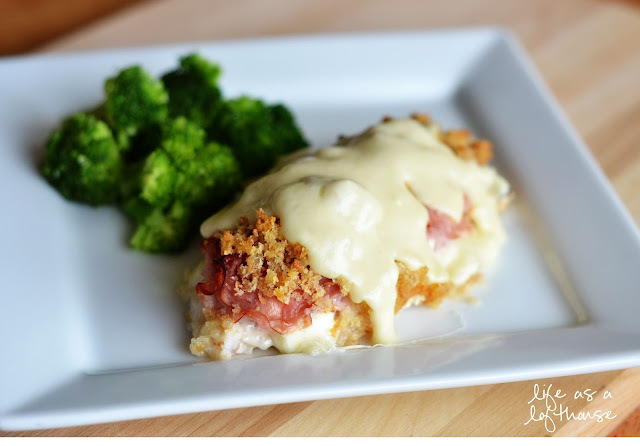 🙂 I love this take on chicken cordon bleu. I think I could handle it! We’ve all had our fair share of disasters 🙂 This chicken looks great though! Mel should have a cookbook. I’m surprised she isn’t slammed with offers. Her recipes are winners! The first thing I noticed was that cream sauce. I was totally won over by the sauce..lol. Love this and your picture too Holly! This batch looks delicious. I love chicken made this way. Great pictures as always. I love to make this dish, but I’ve never used a sauce. Yours sounds amazing…I will make it exactly as you posted next time 🙂 Yummy! I’m sure we all have times like that when we first started cooking!! But this recipe sure does look like a winner!! 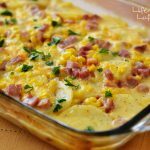 Just made this for supper tonight and my husband and I both LOVED it! I used one slice of ham because mine was big, and I used shredded swiss cheese (because then the leftovers would go on salads). I also omitted the salt from the sauce because I think my bouillon cubes were a bit bigger than called for…and since those are salty – I omitted the actual salt. But we both agreed it’s a keeper! FYI: my husband does not like swiss cheese, but he still loved the recipe. MMMMMM. I love all the recipes I try on your blog, so keep up the great work! I just made this tonight for dinner, and it was perfection. I used a homemade bread that had a sundried tomato seasoning in it, and then in the sauce, I used the Pampered Chef dijon seasoning instead of the mustard (only because I was out of the real thing). My 7 year old, who typically doesn’t like what I cook said, “I’ve arrived in Heaven” after his first bite. And let me tell you, compliments like that are few and far between. Thanks for such a great recipe that can be made so quickly. I love Chicken Cordon Bleu, but I never make it because it’s so laborious, but this, oh, this was genius! This sounds delicious, can’t wait to try it. Is there a recipe for the breadcrumbs to follow? Hoping to following your suggestion to use fresh. Thanks! Used this recipe with left over turkey after Thanksgiving and it was amazing and, I’m sure, just as good with chicken. This was great!! I didn’t even cut the chicken because I was using Chicken Steaks from Market Day that I had on hand in the freezer and it still turned out perfectly. I made the Chicken Cordon Blue for supper tonight and it was DELICIOUS!! This is definitely a keeper recipe and I’ll be making this dish quite a bit from now on. I had some hamburger buns in the freezer, defrosted them and they made the most delicious bread crumbs to top the chicken. The sauce iis quite easy to make and very very tasty. Thanks, Holly, for sharing this wonderful recipe from Mels Kitchen Cafe. I am enjoying your blog immensely and look forward to making more of your great recipes! Is 30-35 min really all the chicken needs to bake for? It just seems like it would need to bake longer. Excited to try this recipe. I made this over the weekend and it was ah-may-zing. I loved the sauce, will be added to the rotation for sure. It’s in the oven now and the sauce tastes amazing! I know you said not to use store bought crumbs, but I did, because I made two new recipes tonigh and each required a sauce, and I ran out of steam! I will use fresh crumbs the next time. Oops! I forgot to add that I didn’t add any extra salt to this. there was plenty with the parmesan and chicken cube. Going onto frequently used recipes on Pinterest. Oh. My. GOODNESS! I just made this and I can’t believe how easy and tasty it was!!! Even my extraordinarily picky husband loved it. In fact, he actually said, “Wow! This must’ve taken a LOT of work!” Isn’t that the BEST… when a meal is so lovely people actually think you slaved in a hot kitchen for hours!!! 🙂 I am elated! I’ve tried chicken cordon bleu before. No matter how much I pounded out the chicken, when I rolled it, it was still much too fat and took way too long to cook. By the time it was cooked through, the outside was dry and tough. It was awful. This recipe is something I will use over and over again. Also, I have to say, I discovered your blog a few weeks ago and have already made 3 or 4 recipes and they’ve all been a hit. You are AWESOME! Made this tonight and it was really good! The sauce made it extra special. Your recipes are life savers!